I must explain my somewhat lengthy blog absence. I have fallen victim to my yearly obsession. Landscaping. I can't get enough of it. Instead of hot actors or winning the lottery, I dream about new planting areas and cashing in bonus points at the local garden center. Weird. Let me be clear, this does not mean I like cutting the grass or edging. In fact, I don't know how to use the lawnmower. That is rather embarassing to admit, since I tackle almost any project myself...but I just like to feign ignorance so I don't have to add another chore to my list, okay?! 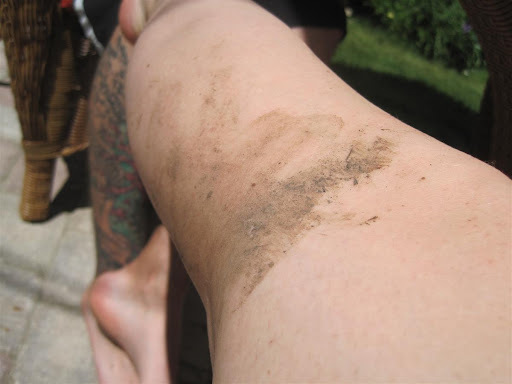 I am out working in the yard every single day after work, and I'm always dirtier than when I was a toddler. The foliage is so stunning! If you don't have catmint already, consider planting some. Not only is it incredibly hardy and fast growing, but the flowers are beautiful. There was a yucky little planting bed near our soon-to-be-renovated sun porch, that desperately needed to be addressed. Not my best work! My first rose! 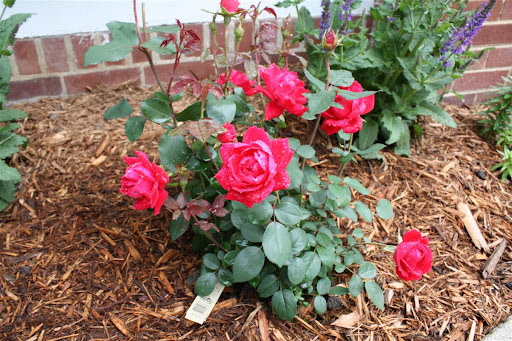 Since I've never had one before, I picked an easy care double knockout rose. 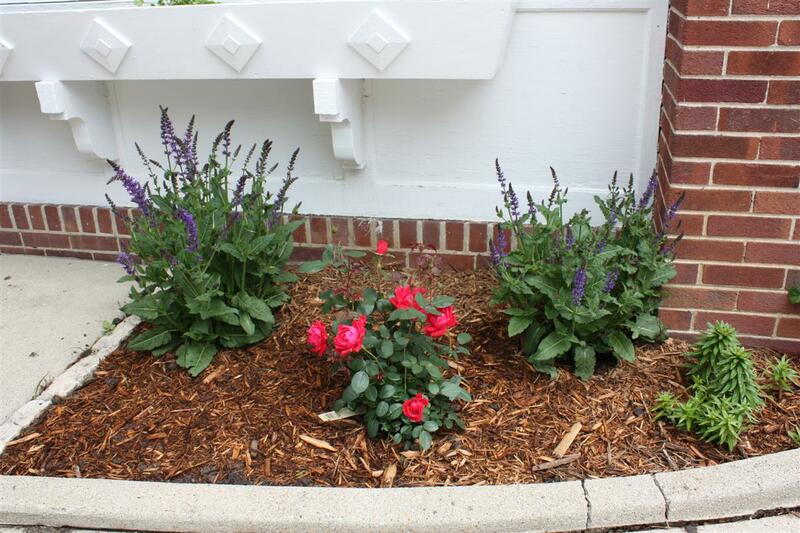 I tossed the coral bells, moved one salvia over and replanted all the lilies further to the right. I'm in love with the purple salvia with the hot pink roses! The only problem is the transplanted salvia is not growing the way the other one is. This photo was taken just five days after the switch....'lefty' is in it to win it! Currently, that left salvia is another few inches higher. So much for symmetry. I also had the pleasure of seeing my Allium grow....they are so cool. I got the bulbs late last fall and sort of hurriedly plopped them in the ground all willy-nilly. I'm so happy with them! 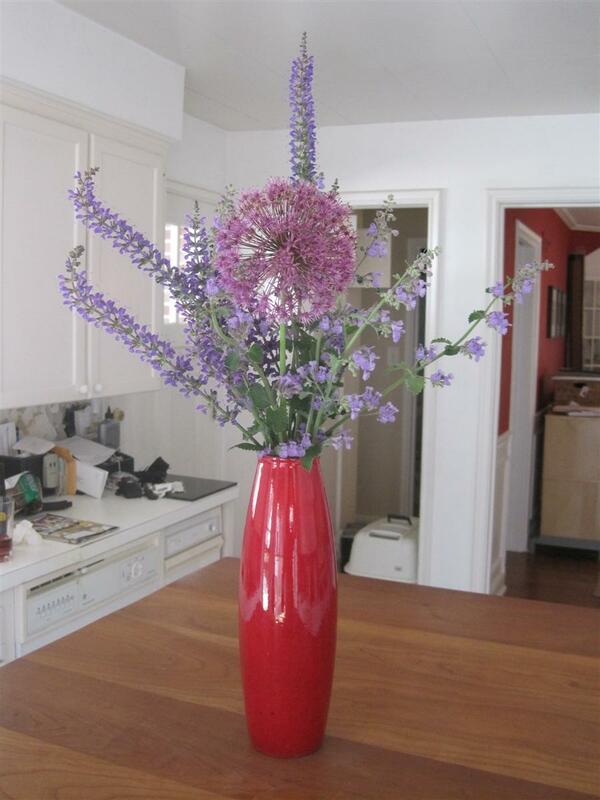 Thanks to the profuse catmint, salvia and alliums, I am able to make little arrangements as often as I like. Obsessed! Me thinks I need some new vases. TJ Maxx, I'm coming. Save me the good stuff. I am like you. I could be in the yard all year. I think that is why I cherish my spring/summer months. I am so excited to see the sun porch reno! 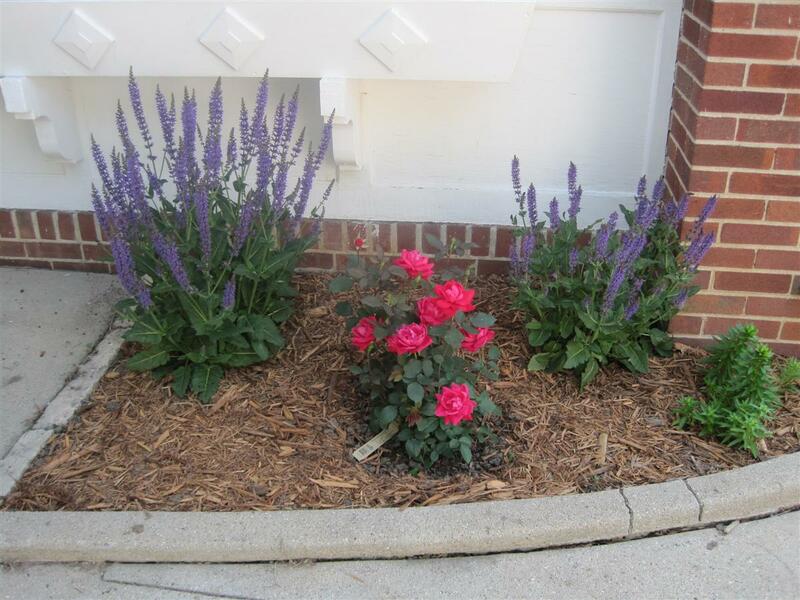 I am totally loving the salvia with the roses, and the alliums...sigh. Whenever I get depressed looking at my yard (which is, um, every day) I'm going to come over here and look at pictures of yours! I love working outside! And I don't even mind mowing / edging. It's kinda mindless and and relaxing. :) The blooms look amazing! I just just wondering what you were doing this past week ..... isn't it great to be back in the garden? I'm doing that this weekend also ... I just got a new front walkway and had an overgrown shrub pulled out so I have to completely re-configure my front bed ... woo hoo another trip to the garden centre. Your willow is pretty awesome. I think I have to do some research and find one for my yard. So many pretty flowers! The Dappled Willow is extraordinary! Hey, what kind of Lily is that near your rose, do you know? I have one in my yard and would like to get more. It's one of the few plants hardy enough to last all winter, and they're beautiful when they bloom! I always start pulling and tugging on things when I get home from work, before I go in and change out of my work clothes. Next thing I know I look down and my heels are sunken into the ground and my work pants are covered in dirt. True story. I should really change first. I'm going to consider that catmint. I'm in the process of re-doing my entire parking strip and am in need of some hearty fast-growing space-filling plants. And if it does well in your WI winters, then surely it should do well in SLC?? Ohh I love how your flower garden looks!! 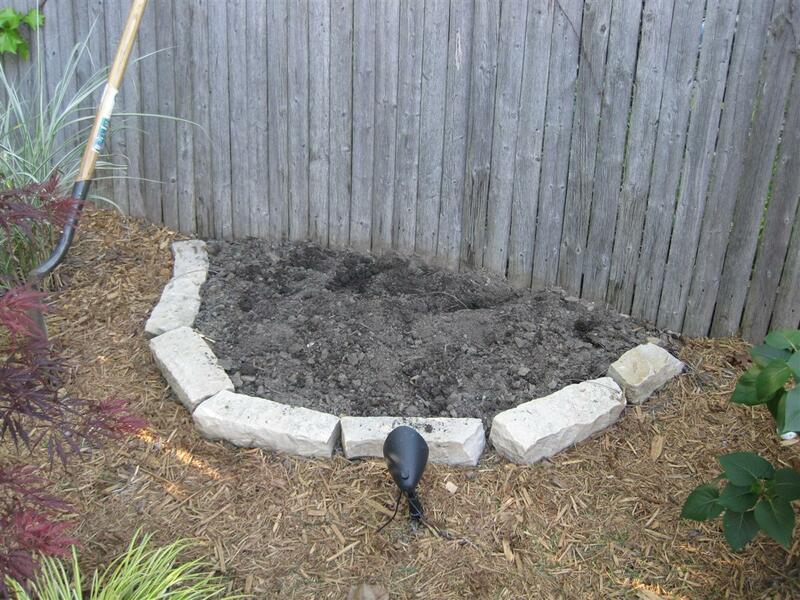 I love getting outdoor projects done before it gets super hot here CA - we did alot of planting last year. Catmint! Thanks for sharing the picture and the name--it's one the unidentified plants in our yard and everybody has been asking what it is. Mint was all I could tell them. We have crushed up the leaves and used them in mojitos and it was yummy. Love that catmint! I don't have any and now it's on my wishlist! And your rose is gorgeous. I don't have any of those, either. Oh yeah, I should totally have you over to help me reign in my wild garden. I'll do the mowing, you do the weeding, deal? Pink Heli - those are Asiatic lilies. They are available at Home Depot right now, they have tons. Just a word of caution - once you plant them, they keep coming back, even if you move them. So pick your spot carefully because they aren't leaving! They are lovely, though. Your yard looks great...beautiful choice of flowers! I just did a post on my perennials coming in too. I don't know why I'm surprised every year when they come back?!? I love all the colors, and I'm jealous of your homemade arrangements! Do you make house calls?! i love, love, love alliums and sadly have none in my yard. aahhh.... your flowers are gorgeous!! We have similar taste in landscaping! I have a dappled willow in the tree form as well as 3 hot pink double knockouts. It's hard to judge from the photos but that rose may not have enough room where you have it. 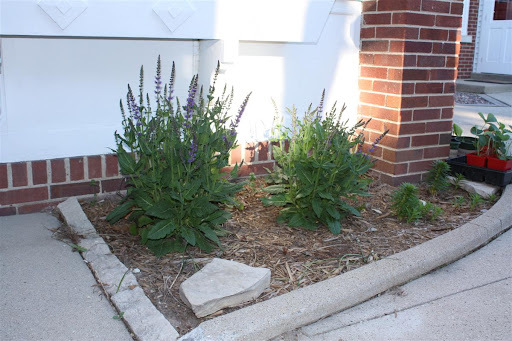 I planted mine last June and by the end of summer they were 3 feet tall and 3 feet wide! Right now they each have 30-40 blooms and they are just getting started. You don't have to deadhead the spent blooms but I take a few minutes each week and do it and I think it helps them bloom more. I love my knockouts. The rest of your landscaping looks awesome too! I love the little stone wall. Jen - the rose will have enough room for it to grow three feet wide, but I may be trimming those salvias to make room! Unfortunately, we don't have any other full sun location for it. I hope it works out! Thanks for all the plant names - they'll come in handy when we finally make some plant purchases for our front and back yard. You have great taste in landscaping! Sooo funny that I just read this post. For some reason, I had a dream last night that we just got new landscaping in our backyard! Hahaha...in my dream I was standing in the doorway looking outside and thinking, "wow...we should have done this sooner!" haha- looks awesome! I am right there with you in neglecting the blog in order to work outside. Spring and Summer are just so perfect that why would anyone want to be inside on a computer? And all your hard work has paid off by the looks of all your beautiful plants! All the flowers are SO pretty. I swooned over the poppies in the other post. 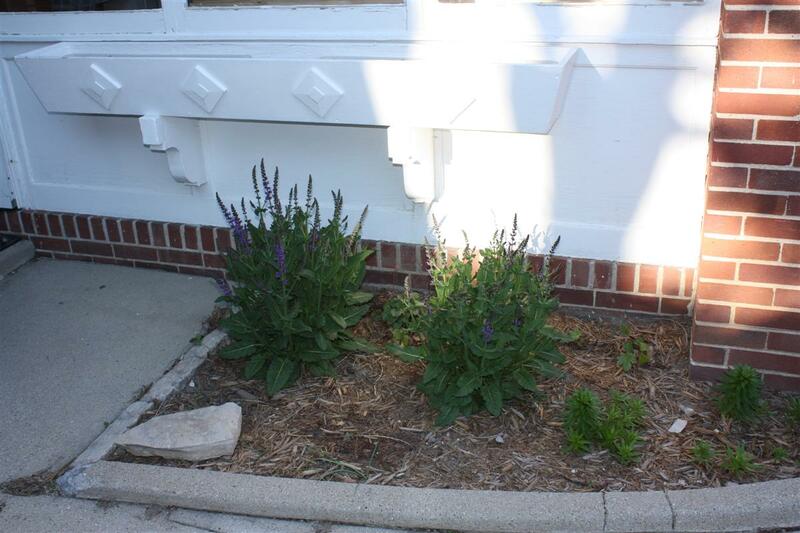 We recently purchased two salvia plants and mine don't look nearly as nice as yours. Ours have migrated wide, vs. tall. Still pretty but just not as happy as yours!